We’ve been celebrating Shabbat each Friday for nine years now. We love it, and couldn’t imagine our week without it. 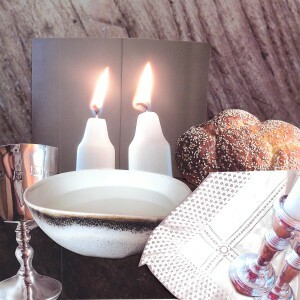 If you’ve not come across Shabbat, it’s a traditionally Jewish ritual Friday night meal with prayers and blessings. Our two children, age 4 and 5 join in with the songs, the actions and some of the Bible verses we say. We’ve shared it with lots of different people, both Christians and not, and we’ve adapted it as we’ve gone along to keep it accessible and relevant to everyone present. Whenever I mention that we do Shabbat on a Friday, everyone always asks “Why do you celebrate Shabbat? Are your family Jewish?” The short answer is: Yes, my Grandad is Jewish, although not a practicing Jew. I first experienced Shabbat at the home of my ‘adoptive’ parents when I was a student. We first started celebrating Shabbat as a way of starting a day of rest as a family together. Nine years and two children later, we find it’s a good way to have a moment in time together as a family with God – a great ritual for developing faith at home. The easiest way to explain what we do is to share our own mini-service along with some ideas of the principles we’ve found and how you might apply these ideas in your own family rituals. (You can also download a free printable version or buy a printed copy here). The words in bold are ones we read out loud, while those in italics are instructions. This meal marks the beginning of a time of rest as a family together. We stop and rest from our work, just like God rested from His work of creation. We celebrate the freedom God has given us, just as He brought freedom to the Israelites when He set them free from being slaves in Egypt. Stating our intention is a great way to remember why we’re doing a ritual. It also helps visitors know what we’re doing. Sometimes I give or even send visitors a copy of our service sheet so they can read in advance what they’re getting into! I love how this welcome calls us to actively live in the rest and freedom which God gives us. I light the two Sabbath candles to remind us of the rest and freedom God gives us. As I light them, I welcome Shalom Bayit, peaceful harmony in our homes. We bless you, Lord our God, King of the universe, who has given us Jesus, the light of the world. Thank you that whoever follows You will never walk in darkness, but have the light of life. Waft the light three times towards yourself, representing more of Jesus’ light in your life. Then waft the light outwards three times, to represent spreading the light of Jesus into the lives of those around the table, your loved ones and the wider community. Lighting candles is one of four physical symbols we use, along with water, bread and wine. Physical symbols make rituals a multi-sensory, intergenerational way of sharing faith together. We find that giving meaning to physical symbols help people at all stages of the journey of faith come close to God in a way other things may not do. Lighting the candles with these words and actions It gives an opportunity to consciously welcome the goodness of Jesus into our lives and the lives of those around us. As with each symbol, it would work to just take this first section as a stand alone ritual – light a candle over dinner or breakfast or even before watching a film together and welcome God into your home. The Bible says that only those with clean hands and pure hearts can stand in God’s holy place. We wash our hands with water and ask Jesus to make our hearts clean. I wash my hands to Messiah, the hope of glory, to serve Him only. Our second symbol, water, provides a weekly time to say sorry to each other and to God and to be forgiven. We make sure it’s option, and visitors are invited to pass it to the next person if they prefer. However, we’ve found most people have taken the opportunity to wash away negative things from their lives, and many have apologized to family members either at the table or later in the evening. I thought that the imagery of washing your heart clean might be too abstract for young children, but I’ve found that somehow it communicates to them. This simple ritual of washing could also be done at bath time or whenever you have water handy. These two loaves represent the double portion of manna the Israelites collected in the desert. It is a symbol of the work of the worker. As we break this bread, we remember Jesus and His body which was broken. We bless You, Lord our God, King of the Universe who gives us bread from the earth. Break one loaf and pass pieces around for everyone to eat. The bread is a symbol which intentionally makes connections between two big Bible stories. Although you could use two slices of cut bread, I love baking and so usually cook fresh bread which has the added bonus of filling the house with evocative smells as we prepare for Shabbat. We’ve had traditional honey flavoured challah bread and focaccia, and currently share chocolate naan bread, a family favourite! Wine and juice are symbols of joy and celebration. We drink this wine and juice to celebrate all the good things we have in life and to remember Jesus. We bless You, Lord our God, King of the Universe, who gives us the fruit of the vine. Pass around the cup and invite everyone to sip the wine and juice. One of the things about a ritual is that it needs to be repeated. In some ways it’s better to have one simple, short thing which you repeat than something long and complex which you only do once as somehow in the repetition we find depth and richness we don’t find the first time. Or even the first twenty times! We’ve also found it’s fun to find ways to take Shabbat with us when we’re away – we’ve even done it on a plane, although not with real candles! Once you’ve repeated your ritual lots of time, it’s fun to find ways to adapt it, making it accessible to who’s involved. A good woman is hard to find and worth far more than diamonds. I trust you without reserve, and never have reason to regret it. Never spiteful, you treat me generously all your life long. Your clothes are well-made and elegant, and you always face tomorrow with a smile. When you speak you always have something worthwhile to say, and you always say it kindly. You keep an eye on everyone in our household, and keep them all busy and productive. Charm can mislead and beauty soon fades. The woman to be admired and praised is the woman who lives in the ‘Fear-of-God’. If God doesn’t build the house, the builders only build shacks. If God doesn’t guard the city, the night watchman might as well nap. It’s useless to rise early and go to bed late, and work your worried fingers to the bone. Don’t you know he enjoys giving rest to those he loves? This blessing is a wonderful way to reminds everyone including the children that they are a blessing and a gift from God. God bless you and keep you; God smile on you and gift you, God look you full in the face And make you prosper. Thank you, God, for this food and ask that Shalom, Your peace-filled completeness, will fill our hearts and our lives. Using words from the Bible in rituals is a fantastic way of remembering Bible verses and using them to inform our family understanding of the world. The first two blessings we have found tremendously powerful in affirming our marriage and the delight we have in our children as a gift from God. Finally, I love Shabbat as it is a way to celebrate God alongside our Jewish family, who have kept Shabbat for centuries. What rituals does your family do? What physical symbols do you use? What else might you infuse with meaning? What do you do to make sure your rituals are accessible to everyone present? Do you need to keep repeating your ritual or adapt it to your family circumstances? What Bible verses could you use to enhance your rituals?